My response to last night's new episode of Bravo's Work of Art, including spoilers. The episode began with the group being dragged early in the morning to a little courtyard, and waiting around until a group of parkour practitioners popped up and started bouncing off walls, doing backflips, etc. The contestants were told that they were to use this, along with the walk back to the studio, as inspiration for this week's art challenge- movement. I'm not sure exactly how this combination was put together- parkour had its moment of mainstream popularity like 7 or 8 years ago. Before anything else happened, the artists were divided into two groups based on where they happened to be standing, and told that each group was to put together a unified show of individual works within the theme. Last year the collaborative challenges did not work out well, so I had a lot of doubts at this point. One group decided that they would interpret movement as migration, and picked up junk from the streets on their journey back, with plans to use it for their artworks. 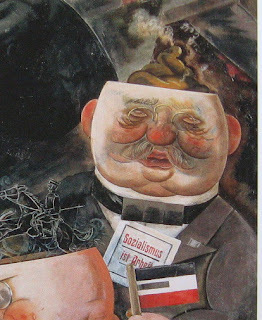 As for the other group, last week's winner Michelle announced that she would like to do a "pooping piece" (a type of movement I suppose, and a subject/material that has been part of art for as long as people have been making it, such as the George Grosz detail shown above), which led to a plan to have the artists in her group do works representing different parts of the body during digestion. Back at the studio, each group started work. Simon came by to see how they were doing. He seemed a little wary of the digestion group, and was completely baffled by the plans of the migration group, so he called everyone together to complain that none of this had anything to do with the parkour demonstration and that they all needed to start over. The poop group decided to go with a playground theme, while the migration group decided to simplify the idea of movement to a loop, and that all works would have a circle in their design. Kathryn saw no reason to change her idea (more of her patented photographed simulated guts), although producing it as a looping time lapse video would be her nod to the circular theme. The playground group's show was definitely the more successful of the two. I didn't see any great art, but many of the pieces were interactive and had a sense of humor. The judges chose Michelle's park pervert sculpture and Bayete' first person spinning video as the two favorites, and gave to top spot to Bayete. They considered the whole circle group to be a failure in terms of interpretation of the theme, as well as a lot of uninspired art. The bottom group included Lola's giant ball of shredded paper held together with hot glue, Tewz's hose and bucket readymade, and Kathryn's blood and guts video. When the judges pointed out that her piece was pretty much the same thing she made last week, Kathryn burst into tears and had a sobbing breakdown, a clip of which has been featured prominently in all the ads for the season. The judges decided it was time for her to go, because of the art and for her own well being. This wasn't a case like last season, where a collaborative group threw team member Erik under the bus, but more like last season's book cover challenge, where Judith decided to ignore the assignment and do her usual art. Kathryn is so locked into her process and product, that it looked like she was not prepared to do anything else. By contrast, Michelle went away from her much admired cut paper sculptures this week and ended up with a successful piece anyway. There are a lot of things about the way this show is put together that I disagree with, but it is the producer's game, and those who don't want to play along can't expect to hang around for very long.